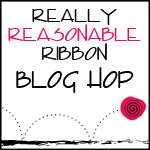 Really Reasonable Ribbon Blog: RRR November Blog Hop Winner!! This is the second post of the day. Be sure to scroll down to see the beautiful holiday ornament tutorial I shared today. Now, on to our winner who will receive the November Ribbon Club Assortment along with the other fun goodies shown here which are all available at Really Reasonable Ribbon. Congratulations to Jess on the win. Wow! Thanks so much! Can't wait to play with the goodies!